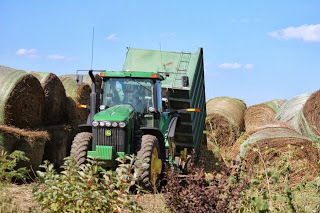 After the fire that we had on our farm that burned up all of our hay bales, Kevin decided to chop silage this year to help feed the cattle during the cold winter months. 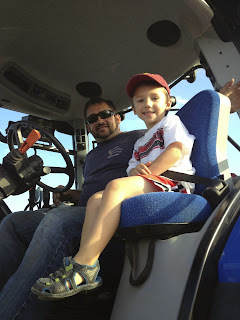 Kevin’s grandma said the last time silage was chopped on our farm was probably in the early 80s. Silage is just the green corn plant that is chopped early. The stalk and ear are all chopped with a forage harvester and then dumped in a large pile. That pile is then packed by a tractor. A lot of times farms will have silage pits or silos that they pack the silage in, but our silo hasn’t been used in years and we don’t have a silage pit, so Kevin just stacked up some hay bales from our other farm to form walls and the silage was packed in between them. 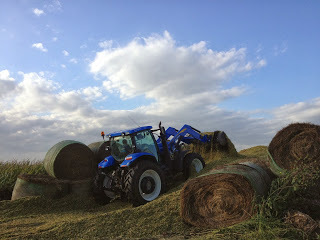 We had about seven acres chopped on Wednesday afternoon that roughly replaced the tonnage of hay we lost. By that evening, Kevin and HD had it all packed. It will eventually form a crustlike layer on the top to protect the pile of silage from the elements and from spoilage. When we get ready to feed the silage to the cattle, it likely be mixed with DDGs, ground hay and/or cornstalks in a mixer wagon. DDGs are a byproduct of the ethanol making process. It is a high value protein from the corn kernel that is separated out when ethanol is being made. About one third of a bushel of corn comes back as DDGs when ethanol is being made. 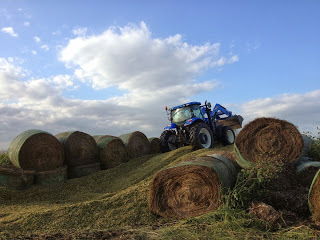 Once mixed, it will be fed to the cattle to supplement their diets of free choice hay, cornstalks and other forage left in the fields during the winter months.